Home > > Nourish Your Skin with Natural Magnesium Spay Made Easily at Home (Recipe)! Nourish Your Skin with Natural Magnesium Spay Made Easily at Home (Recipe)! Some people can’t get enough magnesium and see a huge difference in how they feel when they increase their magnesium level transdermally. I’m one of those people who just can’t get enough and have found a world of difference adding magnesium soaks to my routine! I do take a magnesium supplement; however, many studies have found that the body does not readily absorb the magnesium from supplements very well and only a small portion is absorbed into your system. I also like to increase magnesium through taking either an Epsom salt bath or adding magnesium flakes to my bath. I do Epsom salt foot soaks too. The baths and foot soaks work fantastic! But, I often don’t have time to do them daily or sometimes go a full week without doing either. Topical magnesium, a method of delivering minerals to the body through the skin, may seem at first mysterious and new, but it’s based on both age-old principles and cutting edge science. Have you ever used a patch to help you quit smoking, or to alleviate pain? What about Ben Gay? Or how about that expensive skin creme you bought to help give your skin a healthy glow? If you’ve used or are familiar with any of these products, then you are familiar with the basic concepts behind topical applications of magnesium. I wanted to figure out how to make magnesium spray that I could easily just spritz on my skin throughout the day and especially before bed to increase my magnesium when I don’t have time to take a bath. 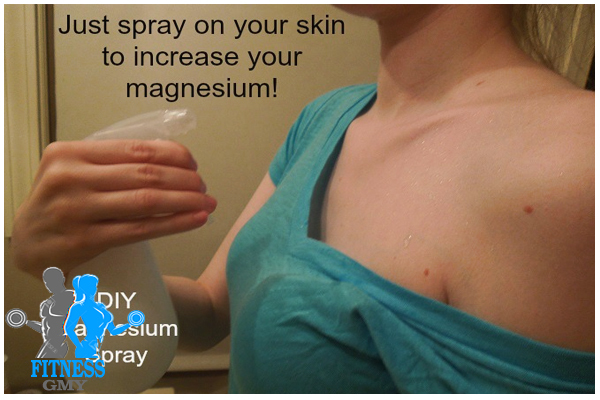 A magnesium spray is very easy to make! All you need is magnesium flakes, or Epsom salt would work too, with water. All you need to use is a spray bottle. Magnesium is an essential mineral that comprises 99% of your body’s mineral content. It’s essential to many functions; yet, most of us aren’t getting enough of it! Magnesium is a nutrient that also gets easily depleted from your body when you’re under stressor if you have anxiety. Why Make A Magnesium Spray? A magnesium spray is super easy to use and you can keep the spray bottle on your bathroom counter and spray it on your skin anytime throughout the day. It’s an easy way to increase your magnesium every day. 1. Add the magnesium flakes and warm water to a bowl. Let it sit for about 5 minutes or until the magnesium flakes are dissolved in the water. 2. Pour the mixture into the spray bottle. 3. Lightly shake and spray it on your skin. Just spray it on your arms, legs, chest, and stomach. The more areas you spray it on, the more you’ll absorb. Sometimes it is easiest to spray it on right after you get out of the shower. How Often Should You Use The Magnesium Spray? I usually spray it on once in the morning and once at night about 1 hour before I go to bed. You can apply it as often as you would like to get optimal absorption. The Importance of Eating Your Greens! Since magnesium is so important for our beauty and our health, how do we ensure that we are getting enough of this mineral? Maybe, you are not aware magnesium is found at the center of the chlorophyll molecule because the capture of light energy from the sun is very dependent upon this mineral. Therefore, dark green, leafy vegetables, which are colored by chlorophyll, should be considered to be excellent sources of magnesium. Spinach is one of these green vegetables that provide us with a powerful source of magnesium. Seaweed, pumpkin and sunflower seeds are also good healthy sources of magnesium. However, whenever we cook or boil these foods, there will be a significant magnesium loss which is why the magnesium content of most refined foods is very low. So eating raw is the way to go!